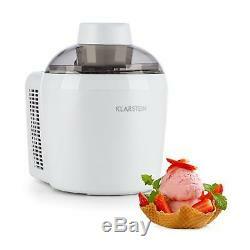 Klarstein Schneeflöckchen Ice Cream Maker Thermoelectric 700ml Quiet White. 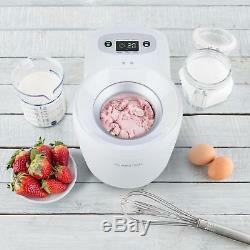 Versatile ice cream maker for ice cream, milkshakes, smoothies or jellies without pre-cooling. Thermo container for up to 700 ml ice cream (0.3 litres of capacity for ingredients). Whisper quiet thanks to thermoelectric cooling system. Versatile: uncomplicated ice cream maker for cold treats like ice cream, milkshakes, smoothies or jellies. No pre-cooling necessary: fresh ice cream in 1-2 hours without pre-cooling the container or the ingredients. Correct portions: thermo container for up to 700 ml ice cream (0.3 litre capacity for ingredients). Whisper quiet: extremely quiet operation thanks to thermoelectric cooling system (no compressor). Economical: only 90 watts of power consumption. Easy operation via two buttons and digital display. 6 selectable, fully automatic programs. Remaining working time display during operation. 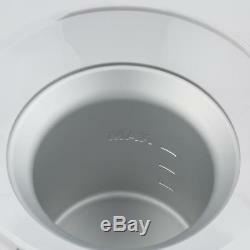 Safety cap in the lid. Anti-slip rubber feet for a safe stance. On / off switch on the control panel. 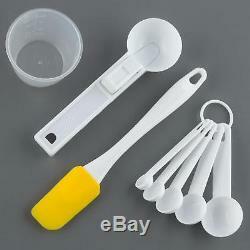 Includes ice tray, spatula and five measuring spoons in different sizes. Dimensions (machine): 18.5 x 23.8 x 26.5 cm (WxHxD). Dimensions (thermal tank): 8.5 x 8.5 cm (HxØ). Weight (device): about 2.55 kg. 1 x cover with drive. 1 x ice cream scoop. 5 x measuring spoons (various sizes). English language manual (additional languages: German, Italian, French,ish). Versatile ice cream machine for making ice cream, milkshakes, smoothies or jellies. Portion-correct preparation of up to 700 ml ice cream without pre-cooling or noises thanks to thermoelectric cooling system. Easy operation with two buttons with digital display and 6 selectable programs. Finally time for ice cream! Delicious ice cream at any time! With the Klarstein Schneeflöckchen ice cream maker , delicious ice cream and juice specialties such as fruit and soft ice cream, milkshakes, smoothies and jellies can be created in no time. Homemade ice cream with delicious ingredients without pre-cooling or disturbing noises. The Klarstein Schneeflöckchen is a true turbo ice cream machine , which can freeze up to 700 ml of delicious creamy ice cream made of selected ingredients in its thermal container within 1-2 hours. This ensures the perfect refreshment on hot days and great fun at children's birthdays - as well as the good feeling that you always know that only the best ingredients find their way into the ice cream. This makes it very easy to cater to personal taste preferences and any restrictions on foods, such as lactose intolerance or allergies. In addition to the preparation of ice cream, the Klarstein Schneeflöckchen ice cream maker can also conjure delicious milkshakes, smoothies or jellies. The ice cream machine accomplishes all of this with a very economical power consumption of only 90 watts. Just a few steps to an ice-cold sensation. 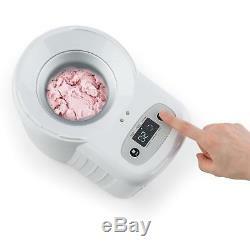 The operation of the ice cream maker is simple and carried out using an intuitive, top-side button control section. With the help of two buttons and a digital display , one of six fully automatic programs can be selected. During operation, the remaining time is displayed. For serving the finished ice cream and for decorating, an ice cream scoop is available. The item "Ice Cream Maker Machine Commercial Thermoelectric Cooling Sorbet Frozen Yoghurt" is in sale since Friday, May 18, 2018. 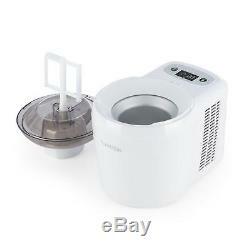 This item is in the category "Home, Furniture & DIY\Appliances\Small Kitchen Appliances\Ice Cream Makers". The seller is "hifi-tower" and is located in Germany +.